When I decided to take part in this year's Knit and Crochet Blog Week, I really wanted to challenge myself to post every day of the week. I looked at the topics in advance and thought about what I'd write for each one, which is the kind of preparation I don't usually do. Unfortunately, Blog Week is happening just before my exams - exams which are entirely in French and in a strange French format which I'm really not used to. I have eight exams, a few hundred pages of revision to get through, and I'm also working a part-time job. So it's tough making time for Blog Week too. However, I don't want to just abandon it, so I'm goin to give you a summary of what I would have written if I had had the time. My perfect knitting day: I would wake up to the sun shining through my curtains. I would have a lazy breakfast with a pot of tea and would have no commitments all day to rush to. Except maybe meeting friends for a picnic or something, that would be a lovely commitment. I would finish a pair of socks in the morning and wear them straight away (they don't need to be blocked!). Then I would cast on a project I've been excited about for months and knit all day. Simple. Once my exams are over I'm hoping I'll have plenty of time for a few perfect knitting days. 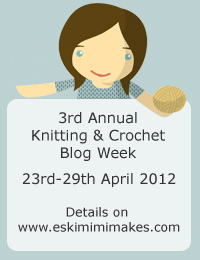 When I started knitting I had no idea there was such a huge online community of knitters. I had so much to learn. I can't remember how I came across Ravelry, but my goodness it's the best thing I've ever found on the internet! So my first knitting heroes are the founders of Ravelry, Jess and Casey, for making so much information available to us. I think without the huge database of patterns and all that information on different yarns, it would have taken me years to figure out all the stuff I've learned from the website. My second set of knitting heroes would have to be The Knit Girllls, Leslie and Laura. They keep me company for an hour a week while I focus on my knitting. I have learned so many things from them - from interesting groups on Ravelry to various techniques (such as an Afterthought Heel). I have also become so much more interested in yarn because of them; the way they get so excited about certain yarns makes me want to try them out some day. And they spin. I had no idea that people spun before I watched The Knit Girllls and now I just want to make my own yarn too! My knitting heroes are knitting heroes because of how easy they've made it for me to keep knitting. Thank you all! I will most definitely be knitting this summer. My three-week contract at work is nearly over, and while I thought it was a tester to see how I got on with a view to hiring me for the summer, it's becoming more and more apparent that they have their permanent staff and just hire poor suckers like me for three weeks when it gets busy. Which means if I'm not re-hired, I'll be spending the summer back home in Ireland. I don't mind so much, I've only been home twice in the past year and it will be lovely to spend some time with my family and friends from home. And summer in Ireland is never too hot, so I'll be knitting comfortably all year round. I really really want an Aidez cardigan for the autumn, so I think that will be my big summer project. My only problem with year-round knitting is that if you knit something warm and woollen in the spring, you can't wear it until it gets cold again. Which is why this time next year I think I'm going to try my hand at designing a simple motif (like the ethnic prints that are all over the high street), knitting it up in cotton and wearing it all summer long.